Njut av den mjuka kvällsluften och romantiken i Florens vid solnedgången på denna 2-timmars elektriska cykeltur. Cykla genom medeltida gator och över floden Arno på en tyst, miljövänlig e-cykel medan en lokal guide delar berättelser från stadens rena renässansförflutna. 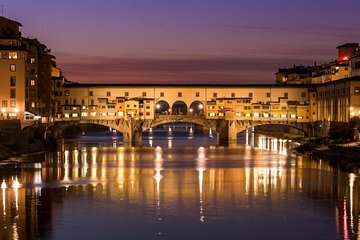 Klättra lätt de florentinska kullarna tack vare en batteridriven ökning och njut av en fantastisk utsikt över den upplysta staden från utsikten vid Piazzale Michelangelo. Belöna dig själv med en god behandling vid en av Florens bästa gelatoaffärer. This was great tour. My guide, Gabriel, made sure I was safe and keeping up. Got to ride to Piazzale Michelangelo for a stunning view of Rome just as the sun was setting the electric-assist bike certainly helped to get up the hill, and then on to hit the highlights of Florences architectural sights at night. The night finished with a delicious gelato. Highly recommended if you like bike riding. This was a great tour! This was a nice way to explore the city without all the traffic. The tour guide was informative and friendly. I would definitely recommend this tour. Fantastic evening activity while in Florence. Our guide was awesome. He kept narrating stories and facts about Florence. Did not rush us at any stop and was extremely friendly. MUST DO! What an awesome experience. The bikes were a lot of fun, the view of the city was incredible at night and seeing some of the sites in Florence at night was amazing. Our guide was really nice and informative, and guided us safely around cars, pedestrians and bumpy roads. In fact, he gave up his bicycle light to put on mine, since my bike didn't have one. Our guide was open to any suggestions that we made, more or less information at each location. I would have preferred seeing a few more sites, and less information at each site, but since we were with another couple and they were asking questions it didn't seem right to ask for less detail. The gelato at the end of the evening was wonderful. We had a hard time finding the location where we were to meet, even asking people around the area they couldn't tell us where we were supposed to be, fortunately we had allowed plenty of time to get to the location so we weren't late. Would definitely recommend this tour, although the bikes are pretty fast, if you aren't comfortable on a bicycle probably wouldn't recommend it. This tour was excellent! We saw some sites we would have otherwise missed, such as the apartment that da Vinci painted the Mona Lisa, and learned some pretty interesting facts. The bikes were easy to use and did required minimal exertion - even up hill. Gabrielle our guide was incredibly friendly and informative and the group was small. 10/10 would definitely recommend. De passage à Florence pour une nuit, la visite en vélo électrique nous a donné un excellent aperçu de la ville. We signed up for this just to have something to do for the evening. It turned out to be one of our best tours of our entire trip. It was just me and my wife so the guide tailored the tour to what we wanted to see and do. We would highly recommend this tour. Gabriel was great. We hadn't been on bikes in years but he helped us and was patient. He was persaonable and funny and encouraging and so informative that it was one of the highlights of our trip.